Dutch scientists have announced a new drug treatment able to reverse aspects of aging in old mice – restoring their stamina, coat of fur and even some organ function – by flushing out "senescent" cells in the body that have stopped dividing. Human trials are now planned. Researchers at the Erasmus University Medical Centre in Rotterdam, Netherlands, have found a way to turn back aging. By giving old mice a peptide that disrupts the binding between two proteins, the mice became fitter and more alert, their coat of fur became fuller again, and organ functions improved. This discovery was published yesterday in the leading scientific journal Cell. Key player in the study is proxofim, a substance developed by the researchers themselves. It disrupts the binding between the proteins FOXO4 and p53. 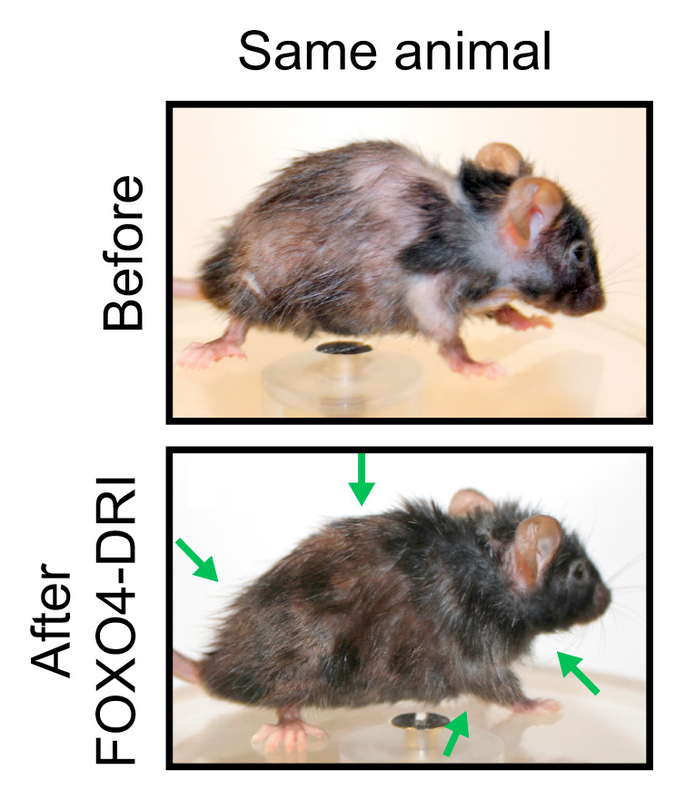 In contrast to existing substances used by researcher to intervene with aging, proxofim was found to have no adverse effects on the health of the mice. "The platelet count and the liver function, for example, remained normal," said Peter de Keizer, a researcher in Erasmus MC's department of Molecular Genetics and a lead author in this study. Proxofim can deal with so-called "senescent" cells that play a significant role in aging. These are cells that have ceased to divide, but are not really dead: "In fact, their metabolism does continue, which means they continue to secrete all kinds of proteins, including inflammatory cytokines," says De Keizer. "These in turn cause more rapid aging of tissues and poorer organ function. They also play a role in cancer. The senescent cells make cancer less sensitive to chemotherapy and can accelerate the growth of tumours. In other words, we actually want to get rid of these cells." Proxofim kills these senescent cells "and it stimulates the surrounding stem cells to create new tissue. It is a peptide, a small protein that can easily penetrate into cells." When applied to mice, this had a major effect. After just three weeks, their running wheel activity nearly tripled, their organ function improved and after ten days their coat of fur became fuller again. The researchers would now like to start clinical trials on humans: "We first want to investigate the safety and efficacy further. We then hope to expand the study to patients with aggressive forms of cancer within one to two years, and then eventually to study geriatric ailments. We do not seek eternal life, but a longer life without ailments and in excellent health would be great."